Zurich, Switzerland -- Zurich's renowned Rietberg Museum has reopened after a three-year renovation with a special exhibition of rare and beautiful early Buddhist art. The revamped museum, which showcases an extensive collection of non-European artwork, has doubled in size and emphasises colour, light and space. The only visible sign of the transformation is a new emerald-green glass foyer. The rest of the SFr46 million ($37 million) extension, partly funded by the city of Zurich, is underground. This annexe, which is roughly 3,000 m², is divided into two rooms: one for works from the collection, some of which have not been seen before, and another for special exhibitions. It was decided to extend the 50-year-old museum in 2001 because it had become too small and needed to cope with a boom in visitors. Architects Alfred Grazioli and Adolf Krischanitz were faced with the difficult task of trying to fit the extension into the existing site – hence the underground concept – and to make it blend in with the museum's other buildings. The new high-tech rooms also feature moveable walls and computer-controlled lights. Colours are used to bring out the artefacts, such as in the Chinese collection. "We always wanted every piece of art to stand there with enough space, in a good light and able to breathe," Albert Lutz, the museum's director, told swissinfo. "But many works of art are very fragile so can only be displayed with dimmed lights." "This new building allows us to display all the works in an aesthetically pleasing way and in a good way for their conservation." Existing buildings have also been revamped, and additions include a traditional Japanese tearoom. But the real highlight of the reopening is the special exhibition on Kannon, the Bodhisattva of Compassion. 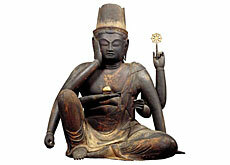 A bodhisattva (or bosatsu in Japanese) is an enlightened being, which is one step away from Buddhahood. But it refrains from entering nirvana, as it wants to help living beings on their paths to enlightenment. "Kannon is maybe the most popular and famous bodhisattva in Japan and many temples have Kannon Bosatsu as their main image," Katharina Epprecht, the curator of the exhibition, told swissinfo. On display are finely sculpted bronzes, wood sculptures and richly detailed paintings on silk. They originate from the 7th century, when Buddhism was introduced into Japan, to the 14th century, the peak of Buddhist art. Only very few of these works, some of which originate from temples where they are not even accessible to the Japanese public, have ever been seen before outside Japan. Among these is the exquisitely carved and many-armed Senju Kannon which is sacred and only shown every 60 years. "It was last shown in 2000 and it would normally only been seen again in 2060 but we got it for this exhibition," said Epprecht, who collaborated with the Nara National Museum in Japan for the display. Another piece has not been moved from its temple for 800 years and its journey to Zurich had to be approved by the city's residents. The exhibition also includes a Japanese National Treasure, the 12th century Jûichimen Kannon, a giant ink and colour silk painting with cut gold and silver foil. Only one artefact, a nine-metre illustrated scroll, loaned by the Metropolitan Museum of Art in New York, does not come from Japan. Spread across the large room, many pieces are displayed without glass and in red and black structures, resembling temples. Epprecht said the idea was to "give spirit" to the space and let the art speak for itself. "There is a 9th century Japanese monk called Kukai who said written sources are never as good at explaining Buddhist thinking as art – it's the beauty of art that makes you understand what it's all about," she said.